I was reading a book on Pastels and Sgraffito technique caught my attention. Sgraffito comes from the Italian word sgraffiare (“to scratch”). Sgraffito is a very old painting technique, which was used for wall decoration and ceramics in Europe since the classical times and was very common in Italy in the 16th century. A variety of tools are used to scratch away different sections of the top layer of the tinted plaster to reveal the underlying colours and texture. While traditionally this technique uses plaster, it can also be created with paints and oil pastels. Toothpick or other tools you can find at home suitable to scratch away the top layer of pastel. It’s not difficult to create our own sgraffito at home. We did our first piece of work using this technique and Dot was very excited throughout the whole process. First, I helped her to draw the lines so that she could colour her first layer of paints. 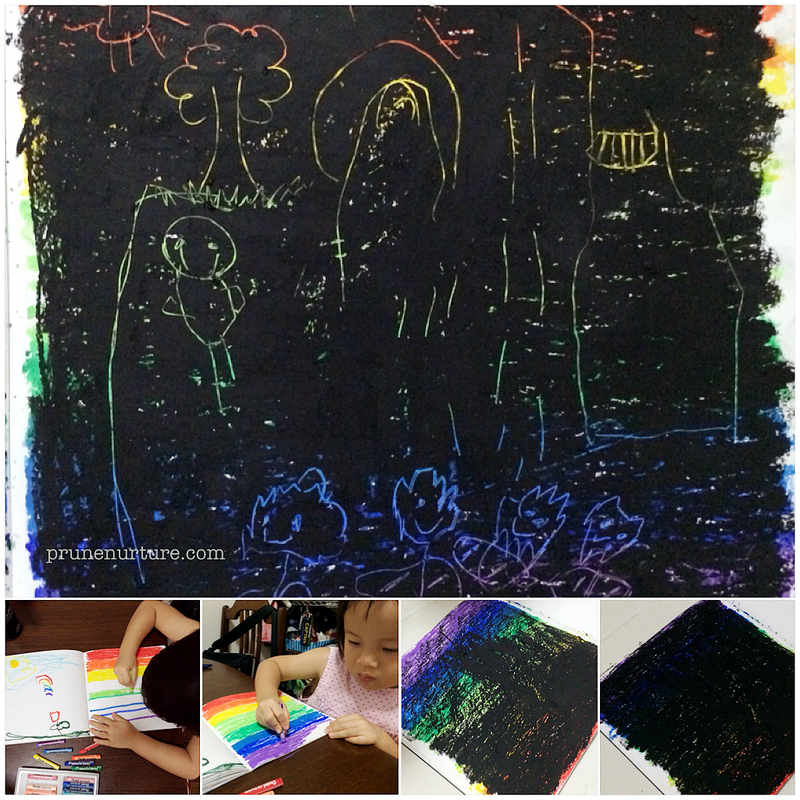 After her nap, she covered her rainbow painting with black oil pastel. The most exciting part of this process is to scratch off the top layer to create a painting that reveals the multi-colours underneath.